Pyloric stenosis occurs in 1 in 500-1000 live births, affecting 4 males for every 1 female1. 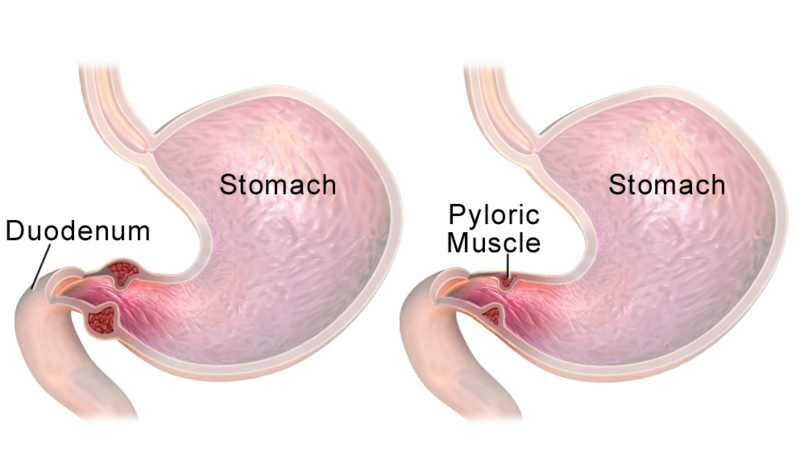 Pyloric stenosis is characterised by progressive hypertrophy of the pyloric muscle, causing gastric outlet obstruction2. The aetiology remains unknown2. The primary risk factors are male gender and a family history of pyloric stenosis3. Pyloric stenosis presents at around 4-6 weeks of age with non-bilious vomiting after every feed3. Vomiting is very forceful, and is typically described as projectile2. Despite this, babies will continue to feed hungrily. Haematemesis has also been reported. Weight loss and dehydration are very common at presentation3, ranging from mild dehydration to hypovolaemic shock. On examination, there may be visible peristalsis and a palpable olive-sized pyloric mass, best felt during a feed3 (see below). If bilious vomiting is reported, don’t forget to think malrotation! A test feed should be performed with a NG tube in situ and the stomach aspirated. Whilst the child is feeding, the examiner should palpate for a pyloric mass and observe for visible peristalsis. Ultrasound is the imaging modality of choice4. An ultrasound of the abdomen will demonstrate hypertrophy of the pyloric muscle, with wall thickness >3mm, length >15mm and diameter >11mm5. See https://radiopaedia.org/cases/pyloric-stenosis for useful images. 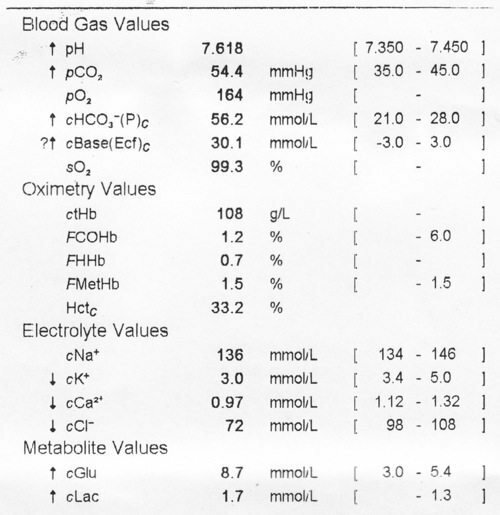 Blood gases will typically show a hypokalaemia, hypochloraemic metabolic alkalosis2 (Figure 1). This is due to the loss of hydrochloric acid with the repeated vomiting of stomach acid causing a hypochloraemia and metabolic alkalosis2. The kidneys will then exchange potassium to retain protons to attempt to compensate, leading to a hypokalaemia2. Metabolic derangement is less commonly seen now, due to earlier presentation and diagnosis3. Peri-operatively it is important to correct any underlying metabolic abnormalities. Patients may require 10-20ml/kg fluid boluses for acute hypovolaemia. Oral feeding should be stopped and a NG tube passed and aspirated at 4 hourly intervals. Rehydration should then be commenced at 150ml/kg/day, using crystalloid as per trust policy. Blood gases and U+E’s should be checked regularly, and acted upon accordingly. Once dehydration and electrolyte abnormalities have been corrected, fluid can be reduced to usual maintenance rates. Pyloric stenosis is surgically managed, with a Ramstedt’s pyloromyotomy7 and should not be undertaken until any fluid or electrolyte abnormalities have been correction. Surgery can be performed laprascopically or through a supra-umbilical incision and the muscle is divided along down to the mucosa7 (Figure 2).This is successful in the majority of patients, with only 1-2% experiencing restenosis2. Babies can resume feeding after 6 hours, although there may be some residual vomiting8. Post–operative vomiting is common after surgery, due to gastric distension and dysmotility9, and is not necessarily a sign of incomplete myotomy. At what age does pyloric stenosis normally present? What does vomiting normally occur in pyloric stenosis? If billous vomiting is present, what is an important differential to consider? What is the best imaging used for pyloric stenosis? How many hours after surgery can the baby resume feeding?